The disease referred to as pancreatitis affects the pancreas of people, cats, and even dogs. This disease is not only painful, but can also be life threatening. Despite the seriousness of pancreatitis, it is still a bit of a mystery to veterinary professionals. But throughout the years, more information has been gathered and therefore more thoughts on disease prevention and treatment have developed. The pancreas sits in the abdominal cavity of a dog's body next to its stomach. It is a thin, long, organ that is pinkish in color. Normally it assists in the digestive process by producing various enzymes, as well as hormones that help regulate insulin. If a dog has pancreatitis, these normal functions may be affected and secondary problems in other parts of the abdomen may also occur. Common secondary problems include issues with the gallbladder, liver, and intestines, due to the close proximity of these organs to the pancreas. Pancreatitis also causes inflammation of the pancreas and is very painful to dogs. Typically, pancreatitis is referred to either as acute or chronic, respectively meaning it either occurred quickly and then lasts for days or it has lasted months or sometimes years. Dogs can experience both types of pancreatitis and some breeds are more likely to develop it than others. If your dog has abdominal or belly pain, it may whine, howl, attempt to run away if you try to pick it up, or seem to have difficulty getting comfortable when lying down. It also may appear to have a hunched back. Your veterinarian will also be able to feel your dog tense up during a physical examination if there is a sensitive or painful spot when they are feeling your dog's belly. A dog may vomit for a variety of reasons and pancreatitis is no exception. Vomiting may occur due to the abdominal pain or digestive issues secondary to the pancreatitis. Just like when we don't feel well and aren't very active, a dog with pancreatitis will often be lethargic and not want to move around very much. If your dog has a painful abdomen due to pancreatitis, then it may be more aggressive than usual since it doesn't feel well. Since pancreatitis affects the pancreas and the pancreas plays an important part in digestion, dogs with acute pancreatitis often develop diarrhea or have intermittent bouts if they have chronic pancreatitis. If a dog with pancreatitis is lethargic, it may not want to drink much water. It may also develop diarrhea due to the issues with the digestive tract. The combination of these two things can quickly lead to dehydration. Dehydration in and of itself is serious and dogs with pancreatitis are often on IV fluids for this reason. If there is inflammation in the pancreas, a dog will often have an elevated core body temperature, called a fever. You can easily check your dog's body temperature at home. A dog that doesn't feel well, has abdominal pain, and is vomiting usually doesn't want to eat very much. This is of course an extreme response to pancreatitis, but if an acute pancreatitis attack is severe enough, or symptoms of pancreatitis are ignored long enough, it can be fatal to a dog. In people, pancreatitis occurs when the digestive enzymes (amylase, lipase, protease, etc.) that the pancreas produces are activated before they should be. These enzymes usually get activated in the small intestine after they travel out of the pancreas through the pancreatic duct. But with pancreatitis, these powerful digestive enzymes are activated in the pancreas. This leads to the pancreas itself being digested instead of the food in the small intestines. It also causes inflammation, as well as the other symptoms. Pancreatitis can occur with physical trauma to the pancreas, such as in a dog that was hit by a car, but sometimes there is no known cause for pancreatitis. In dogs, it is often thought that a meal that is high in fat causes pancreatitis, but it can also occur spontaneously or after steroids are administered. There is a lot we still don't know about pancreatitis. Pancreatitis in dogs is diagnosed by a veterinarian by observing physical symptoms, completing a physical examination, and running some laboratory tests. Tests may include checking your dog's white blood cell and red blood cell counts as well as running some organ function tests and a specific test called a canine pancreatic lipase immunoreactivity test (cPLI). X-rays and an ultrasound may also be recommended by your veterinarian. If you have a breed of dog that is predisposed to developing pancreatitis, your veterinarian may put that disease higher on the list of possible ailments and skip some tests. Miniature schnauzers are unfortunately very prone to developing pancreatitis, as well as some terriers, poodles, and cocker spaniels. Veterinary treatment is needed if a dog has acute pancreatitis. In order to allow the pancreas to rest and heal, oral foods will need to be stopped and IV fluid therapy will need to be started. Antibiotics and pain medicine will also be given alongside other medications to treat your dog's specific symptoms. Most dogs will be hospitalized for several days while these treatments are being administered. Oral food will slowly be reintroduced as your dog starts feeling better and the symptoms of pancreatitis resolve, but typically a low fat diet is recommended for dogs who have ever had pancreatitis. If your dog has a chronic pancreatitis, such as what many miniature schnauzers experience, it may have flare-ups of pancreatitis symptoms that may be bad enough that veterinary intervention is needed. These flare-ups may also need at-home, symptomatic care, such as managing vomiting, syringing fluids, and administering oral medications. Chronic pancreatitis is thought to be much more common than is diagnosed. Even though no one really knows exactly why pancreatitis occurs, we do know that pancreatitis is not a contagious disease. This is not something you need to worry about another pet or yourself contracting. High fat diets, especially a sudden meal of fatty foods, may cause pancreatitis in dogs, so a low fat food is typically recommended by veterinarians after your dog has been diagnosed with pancreatitis or is a breed prone to pancreatitis. As counter intuitive as giving fats may sound, this specific type of fat—found in fish oils—actually helps to normalize blood lipid levels, which are often high in dogs with pancreatitis. By feeding small meals several times throughout the day, you are decreasing the stress on the pancreas. Obesity may contribute to pancreatitis and lean dogs have been shown to be much healthier overall when compared to dogs that are overweight. If your dog has chronic pancreatitis, flare-ups are usually able to be managed at home. 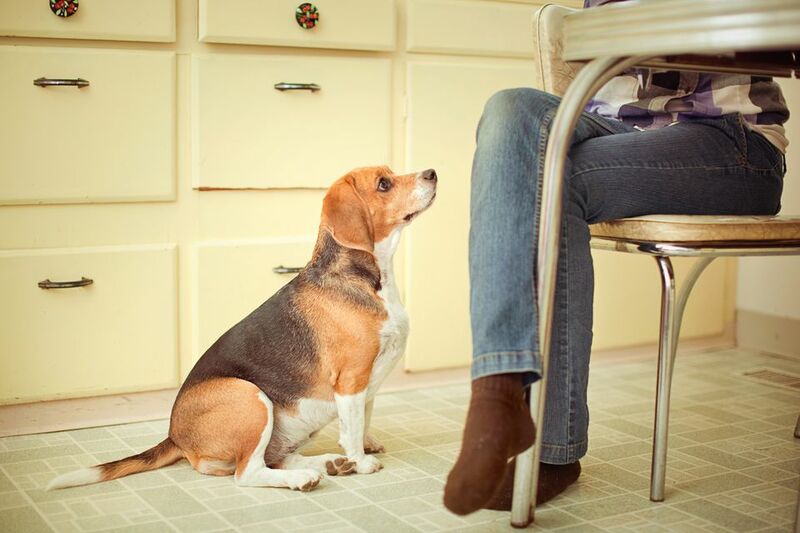 Watch your dog for any changes in the amount of food it eats, its activity level, and its bowel movements. If your chronic pancreatitis dog starts vomiting or hunching its back as though its belly hurts, then you should contact your vet immediately to avoid more serious issues.